Join the Ad Hoc Committee on the Multicultural Requirement for a campus forum to discuss the aims of the “multicultural requirement.” In early April 2019 the committee will share recommendations for a revised title, description, and/or unit requirement, including a rationale for this recommendation. Persons with disabilities who anticipate needing special accommodations or who have questions about physical access may email sschraeder@csustan.edu in advance of the forum. RSVP and/or Provide Feedback Today! To comply with expectations set forth in EO 1100 Revised, in Spring 2018 the Academic Senate approved changes to the General Education program and to the Baccalaureate Degree Requirements. Among these changes, the “multicultural requirement” was moved from a requirement housed within the General Education program to a Baccalaureate Degree Requirement that may be completed within or outside of General Education. With the move, the General Education Subcommittee is no longer the appropriate body for reviewing and approving courses for “multicultural” designation, and a new process for conducting this review must be developed. Throughout discussions of ways to comply with EO 1100 Revised, there was widespread and unquestioned support for maintaining some form of multicultural coursework as a required component of the Baccalaureate Degree Requirements. Questions arose regarding whether “multicultural” is the appropriate nomenclature for the requirement. Questions also arose as to whether our current description of this requirement reflects what students will gain through the requirement, and if the means for reviewing courses ensures focus on intended outcomes. Further, some suggested expanding the requirement beyond 3 units. 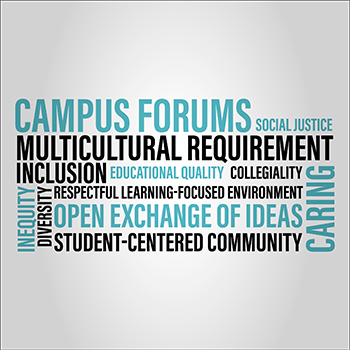 In late fall 2018, the Ad Hoc Committee on the Multicultural Requirement was formed to engage the campus community in a review of the aims of the “multicultural requirement,” and submit to UEPC a proposal to affirm the current requirement or a recommendation for a revised title, description, and/or unit requirement, including a rationale for this recommendation. In addition to actively seeking input from all members of the campus community, the committee is encouraged to review the history of the multicultural requirement at Stan State, records from governance discussions about the multicultural requirement, similar requirements at other CSUs and universities, and other relevant documents about diversity and inclusion on college campuses. Visit the Ad Hoc Committee Website for a DRAFT Proposal!